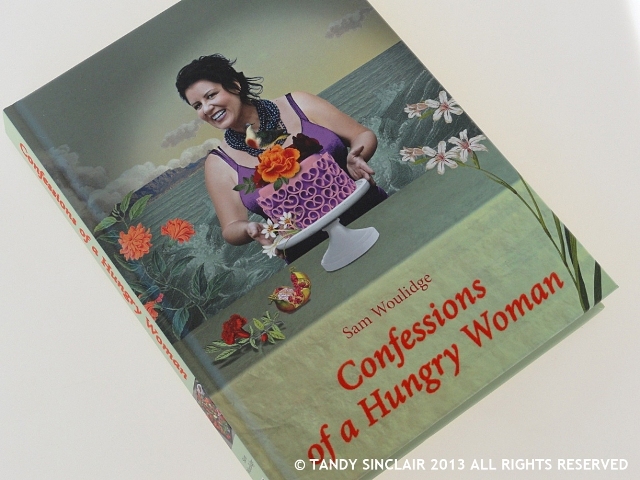 Confessions Of A Hungry Woman is a collection of Sam Woulidge’s columns from various Taste Magazines dating from 2006 to 2011. As a collector of these magazines it was great to dive back in to some of my favourite (and I thinks Sam’s) favourite story’s. I bought my book to show my love for Sam, her writing and her friendship. Just before we went to Napoli last year, I paged through the book, hoping her article on where to buy the best pizza would feature. Pizza – Pure & Simple can be found on page 82 and 83 and the best pizza can be found L’antica Pizzeria da Michele. That is, if you can find the pizzeria! Sam is a self confessed ‘non cook’, preferring to spend her time eating. If she has guests over, she would rather entertain than slave in the kitchen. And so, the recipes in the book are not Sam’s. Sam showcases recipes she can make as given to her by various people. These include Alida Ryder, Jacques Erasmus who owns Hemelhuijs, where I first met Sam and Peter and Mariana Esterhuizen amongst others. Maraiana is the chef at Mariana’s in Stanford and her husband Peter runs the front of house. Her honest cooking and his wit make for a dining experience like no other. The stamp on the front cover implores me to eat with my heart and this is something I find easy to do! If you have not read any (or all for that matter) of Sam’s Confessions of a Hungry Woman columns then rush out and buy her book – you will fall in love with Sam’s words. Tandy, I love your reviews. You always show me something that I’ve never seen before. I just adore her writing! Oh, I must see if I can get this book here – sounds like I would enjoy it.